In my case, the activity was cleaning out closets, sorting and packaging items for donation and recycling, and discarding the rest. What made this activity different was that the items belonged to my mother, who passed away earlier this year. I had help from my sister, and moral support from my dad, who provided some historical context and occasionally notified us that certain objects were still in use by him and should be left alone! My mother was an organized person, so we didn’t find her possessions in massive disarray. However, what we did find is typical of what I find in most of my clients’ homes: a lot of things that haven’t been used in a long time, and in some cases have been forgotten. My parents moved into that apartment 37 years ago. My sister and I were not quite out of the house — she had just finished college, and I was about to start — so we moved into a 3-bedroom, 2-bath apartment with ample closet space. In recent years, my mother had begun giving away items she no longer used, which is why the quantity of items she left behind surprised me. I guess once there were only two of them living in an apartment that used to house four, my parents were able to expand into the empty rooms and closets. We tend to accumulate things until we run out of storage space. And we don’t use what we can’t see.Going through my mother’s closets made me realize how important closet design is. 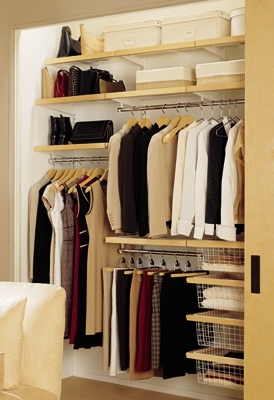 Closets should be designed so that we can easily see everything stored in them. My parents’ closets generally have two clothing racks — one in front, another in the back — and two very deep shelves above them. Half the clothing is obscured, and three-fourths of the items on shelves can’t be seen from the floor. This is sharply contrasted with the California Closets in my apartment. All of mine are walk-in closets, with shelves running from floor to ceiling alongside the clothes, and all clothing racks visible. (I can’t take credit for this, as they had already been converted when I bought the apartment). If you own your space, make sure you can see everything in your closets. If you can’t, consider a closet makeover. The Elfa system at the Container Store is one very good option. Even if you rent your space, it may be worth the investment to make some improvements to your closets.